The old cliché in business is that smart companies underpromise and overdeliver. But in a crowded marketplace, underpromising is a one-way ticket to oblivion. 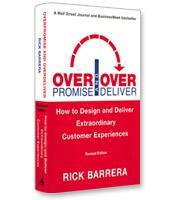 In Overpromise and Overdeliver, Rick Barrera shows that today's most successful companies master Touchpoint Branding — the art of making sure that every point of contact between a company and its customers is well executed and fulfills an over-the-top brand promise. How to use an approach that turns also-rans into winners. How to craft your own unique overpromise based on a complete understanding of your market. How to take full advantage of the primary points of interaction between a company and its customers. How anyone can create extraordinary customer experiences.